Yesterday, Prince Nicholas of Sweden, son of Princess Madeleine and Christopher O'Neill, was christened in Stockholm. 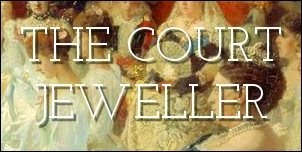 Let's have a look at the jewels worn by his royal relatives for the occasion, shall we? Princess Madeleine's outfit didn't need much accessorizing, but she added elegant pearl drop earrings to top things off. She also wore her father's family order. We also got a glimpse of a few bracelets on Madeleine's right wrist. The prince's grandmother, Queen Silvia, also wore pearls, including a simple necklace and pearl drop earrings. She also wore her husband's family order. Crown Princess Victoria kept her jewelry streamlined, wearing the diamond drop earrings that were originally a part of Queen Josefina's Diamond Stomacher. Victoria wears these earrings frequently; Princess Sofia also wore them for her wedding this summer. Victoria also wore her father's family order. Princess Sofia wore her father-in-law's family order and (I think) a delicate bracelet. I can't help but wish she'd wear her hair back a bit more often so that we could see her earrings! We also got a quick glimpse of the king's eldest sister, Princess Margaretha, sitting in the second row at the christening. Like many of her fellow royal ladies, she wore pearls and the king's family order. Which of the jewels from this weekend's christening were your favorites?